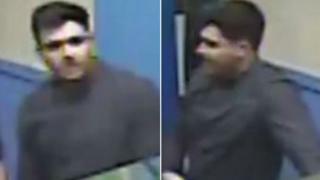 Police in Glasgow are looking for a man in connection with a serious assault in Glasgow. A 19-year-old man was seriously hurt in an attack at 04:00 on Sunday 19 November. The incident happened on Gordon Street at Union Street. Police said the man responsible left the scene and headed towards Hope Street with two other men before walking onto Waterloo Street. They are looking for a man in his early 30s, around 5'10 in height and of medium build with dark hair. He was wearing a dark/black jacket, black jeans and black trainers with white edging on soles and sides.